When it comes time for a new look for your bathroom or powder room, take a look at ceramic tile bathroom floors. While they invoke a sleek, elegant aesthetic feel, they can be installed over radiant floor heating for a comfortable temperature underfoot to avoid the chill that often comes with tile flooring. Textured options can prevent slippage in areas such as bathrooms where splashes from showers, baths, and vanities are common. Easy to clean and durable, ceramic tile is a sensible and fashion-forward trend. Available in a variety of interesting colors, textures, shapes, sizes, and styles, the tiles can even mimic the look of wood and natural stone and play well with quartz, granite, and marble counters. From sophisticated white subway tiles and herringbone patterns to beehive or hexagonal shapes, there are ceramic floor tiles for every bathroom application. Consider combining the different tile shapes artistically to result in unusual optical illusions. 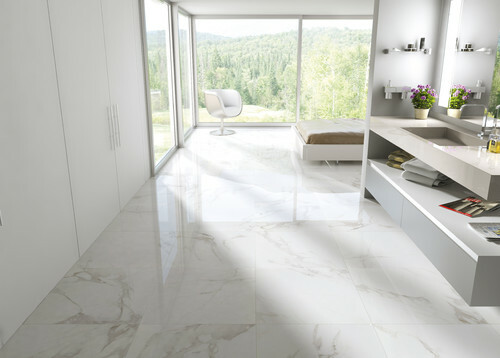 For inspiration and creative design ideas for your new bathroom, or for in assistance matching your design elements and materials with your new ceramic bathroom floor tiles, visit one of our tile showrooms in Baltimore, MD; Sterling, VA; or Harrisburg, PA. For more information, contact Conestoga Tile today.